katilda.com: i now pronounce you waffle and wife. you want to know what's been happening in katilda land this week? and planning outfits for the katilda closet party. ...and that would be false. that distressed green table my hand is on up there? yeah, i refinished that myself last year. it is my biggest claim to domestic-goddess fame. Love the nailpolish! 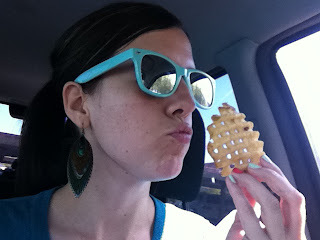 And the waffle fry...I have to be super careful because I work in the same building as a Chic-Fil-A. Dangerous, I tell you. 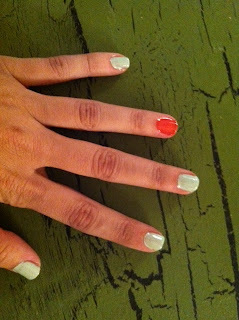 K, I LOVE your nails. SO CUTE! Ahaha. I laughed so hard at the tobacco-digestion-problems thing. i am loving that distressed green table. perfect! I had to fill out insurance forms because my hubs filled them out wrong! What a pain those forms can be! And I swear they are tricky on purpose so that they have to be done twice!